The Westin St. Francis will be transformed into a festive oasis. Join Executive Pastry Chef Jean-Francois Houdré and his team as they unveil two spectacular one-of-a-kind handcrafted castles in the lobby of The Westin St. Francis. This annual holiday tradition began in 2005 with the stunning Medieval Sugar Castle, a life-like French Chateau that becomes more extravagant with each passing year. In past years, the castle has been over 12 feet tall and used over 600 lbs. of sugar. The Sugar Castle unveiling is Wednesday, November 22, 2017. Please note that the Westin St. Francis website might list the opening day as November 23rd, but we’ve been notified by their PR team that it is indeed happening on November 22nd. 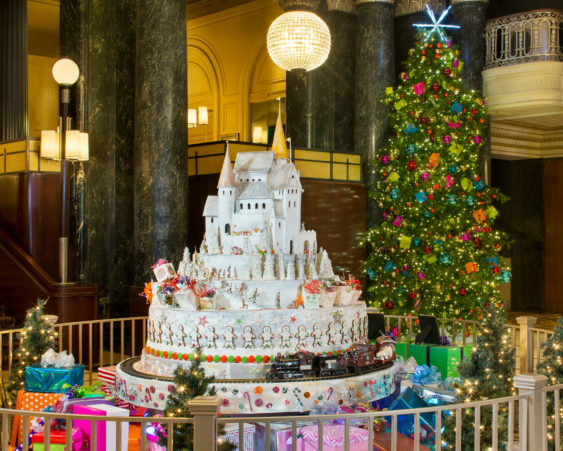 In addition, the St. Francis Enchanted Castle features a winter wonderland of elaborate gift boxes, gingerbread trees and brilliantly colored candies, all intricately handmade with sugar and pastry. The public is encouraged to attend and will enjoy complimentary coffee and tray-passed cookies on opening day, November 22, 2017 from 11 am to noon.